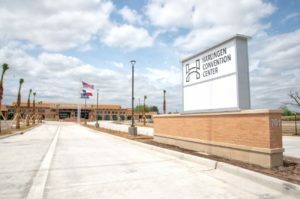 HARLINGEN — When Rey Calara walked into the Harlingen Convention Center, he added it to his list of potential conference venues. Calara, a consultant with Ambit Energy, said he works with energy companies often planning conventions. “That’s why I’m here — to get to know the facility,” Calara, who lives in Harlingen, said as he sat in the building’s grand ballroom awaiting Mayor Chris Boswell’s annual State of the City Address. On Friday, the convention center’s opening carried the air of a social event. 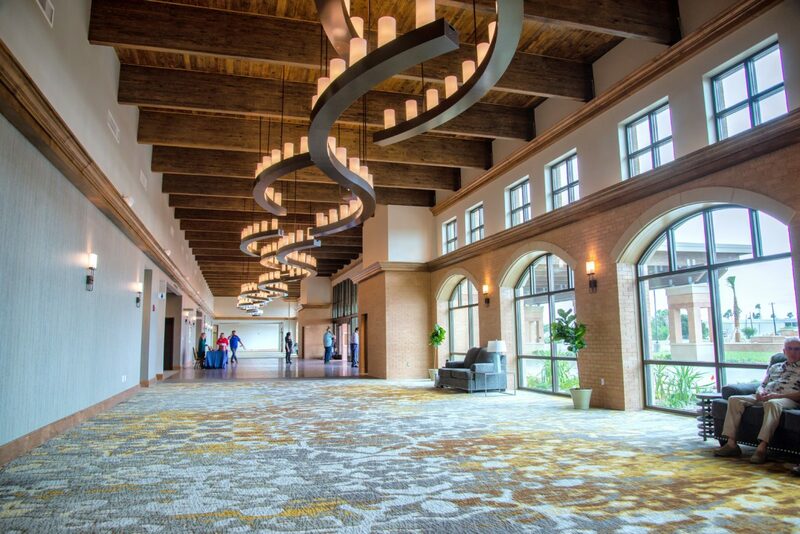 At 701 Harlingen Heights Drive, the 44,000-square-foot building, with its cream-brick façade and tall arched windows, sports a South Texas flair. For decades, businessman Frank Boggus has heard city leaders talking about building a convention center here. “It’s a beautiful center,” Boggus said as he walked into the lobby late Friday morning. For Boggus, the convention center is both an economic engine and a community gathering place. “It’s something Harlingen can use to bring companies in to see what Harlingen can offer for jobs and it’s a gathering place for social clubs and useful for events,” he said. Along the front of the building, is a widespread pavilion that leads to a long porte-cochere — a sort of covered porch — with glass doorways along walls of tall arched windows. Inside, a long, wide lobby runs under twisting light features that hang from rows of beams featuring dark wooden accents. The lobby leads to the sprawling Great Kiskadee grand ballroom, where a long, dark-blue stage stands under tall, elliptical chandeliers. For Calara, the convention center might become a potential venue for an energy conference. The Harlingen Convention Center will help the city compete for conferences, Calara said. Jerry Vasquez described the convention center as a symbol of Harlingen’s economic growth. Kathleen Galiger plans to tell her friends back home about the Rio Grande Valley’s brand-new convention center. During his speech, Boswell said BC Lynd Hospitality plans to break ground on its 150-room Hilton Garden Inn next month. As part of a contract, the city agreed to fund the convention center’s construction while the San Antonio-based developer builds the attached $25 million, five-story hotel. As part of the agreement, BC Lynd will also operate the convention center while splitting any profits and covering half of any deficits. As the company worked on its financing, the project fell about a year-and-a-half behind schedule. Brandon Raney, BC Lynd’s chief financial officer, said earlier this month he expected the hotel to be completed in 12 to 14 months. City officials are counting on the hotel’s opening to help draw more events to the convention center.